The 2018-2019 NBA preseason is underway, and although the games “don’t count”, the critiques of each team’s debut performances have begun. With a couple of games under our belt, we can better analyze each team as they begin working their way through the grueling 82 game schedule. This week, we’re continuing our previews with the Central Division. With the departure of Jimmy Butler, then Dwyane Wade, the Bulls entered full-blown rebuilding mode this past season. Today, their roster is made up of mostly no-name players, a popular draft pick, and a couple of decent vets sprinkled in there to keep fans engaged. So far, they’re 1-1 in the preseason winning their first against the New Orleans Pelicans 128-116, and dropping their second to another team in their division–the Milwaukee Bucks 116-82. Signs point to the Bulls having a bit of a dull season this year, but that’s to be expected of a team who is looking to rebuild their roster after the departure of a main star or two. The good news is that this is any player’s team for the taking. There isn’t an obvious winner for who the most important person on the team will be, but for me, I like to look at who the most viable option is for building a team around. From the moment he entered the league, I’ve been a fan of Zach LaVine. Although he recently sustained a minor thigh injury, he shows to be healthy for the 2018-2019 season and I believe he’s a strong candidate to build a team around. His 6’5″ stature as a point guard gives him a major advantage over his counterparts in the league, and his 16.7 points per game average is sufficient to be a team leader. LaVine begins his 5th season in the NBA with the Chicago Bulls this year having only played 24 games last season. He’s is a fairly sharp shooter at 37.3% from beyond the arc, and he’s consistent at the free throw line at around 82%. ESPN’s Chris Haynes has gone as far as predicting LaVine to be an All-Star for the first time this season. Although LaVine will be a strong performer for Chicago, the team is nowhere near the point of having a roster worthy of a playoff slot. If the Bulls are able to make a couple of smart trades, and acquire some solid draft picks in coming years they could have the makings of a great team. Additional roster aside, my money is on building around LaVine to go the distance. Just this week, I was talking to a friend of mine about who the Cavaliers belong to now that LeBron James has moved on to play in Los Angeles. I said this franchise probably now belongs to Kevin Love, and we both had a good chuckle about it. He laughed because the idea of Love leading that team sounded ridiculous to him, and I laughed because I was totally serious. The Cavs were LeBron’s team. He brought the city their first championship, and they will be forever indebted to him for putting their NBA team and their city on the map. Sure, he had great role players with him along the way, but he was the heartbeat and the lifeblood of the team. Love, JR Smith, and Tristan Thompson will still be around to make Cavaliers fans feel like everything is the same, but everything has completely changed. Coach Tyronn Lue is an amazing basketball mind, but like his roster, he’s nothing without James this coming season. Now, I don’t necessarily expect that Cleveland will completely drop off the face of the Earth and out of the playoff rankings. I suspect they will battle for the 6-8th slot in the East since the Eastern Conference isn’t nearly as competitive as the West. For the sake of their fans, Cleveland will give the reins of the team to Love so the let-down isn’t as hard, and allow a couple of cooling off seasons before finally entering rebuilding mode. If they’re smart, they’ll get some solid draft picks for Love & Smith, and look to rebuild for the future. The Pistons missed the playoffs last season by one slot, although their next best competitor sat comfortably at four games ahead of them in the standings. Although they sat out in the post-season last year, the Pistons are in the fight, and with Blake Griffin in their roster they’re working to build a team suitable for a solid position in the East. Griffin’s trade from the Los Angeles Clippers to the Pistons was a shock for many including myself. Griffin had been the poster-child of the Clippers for so many years, and to see them part ways with him so abruptly took me by surprise. Sure, Griffin can be a bit of a PR problem, but his talent can’t be overlooked. He’s a certified All-Star in the league, and his 21.4 points and 7.4 rebounds per game is certainly worthy of the prestige. As much as I was surprised by Griffin being moved to the Pistons, I actually really like him in Detroit. I think he fits the bad boy image the team has a reputation for, and at 29 years old he’s still fairly young enough to build a team around. Physically, Griffin is still well within his prime, and he’s the strong foundation piece the Pistons needed to take them to the next level. With the shakeup in the Eastern Conference this season, I expect to see the Pistons make a name for themselves in the next couple of years. Although the Pacers were defeated by the Cavaliers in the first round of the playoffs last year, they are serious contenders in the Eastern Conference. Coming in 5th place last season, Indiana had to face King James in round 1 of the post-season, which is unfortunate given that James hasn’t been eliminated in the first round of the playoffs, well, ever. However, Indiana didn’t go down without a fight, keeping pace with the Cavs the entire way before being eliminated in game 7. Now that James is safely stowed away in the Western Conference, the Pacers have more room to spread their wings, and move into the upper echelon of the Eastern Conference standings this year. Put simply, the Pacers win when Oladipo plays, and they lose when he doesn’t. Now, it’s great to have a go-to-guy on the roster who leads the team night in, and night out. But, a team who can’t sustain without this player in the game is alarming. After all, every player needs to take a rest from time to time, and Oladipo can’t be expected to play the full 48 minutes of every game unless he wants to work himself right into an injury. The Pacers have done a great job of securing a foundation piece to build the team around, but they’ll need to recruit and develop some solid support if they plan to make a splash in the post-season. This past week, the NBA’s general manager survey was released, and Giannis Antetokounmpo received the most votes for the one player a GM could start a franchise with. Settling in at 7th place in the East last season, the Bucks headed in to the post-season against the white-hot Boston Celtics. Milwaukee took Boston to 7 games in that series which says a lot considering Boston went all the way to the Eastern Conference Finals for 7 games against the Cavaliers. Unsurprisingly, Antetokounmpo is THE guy for the Bucks, but without him, they don’t have much. 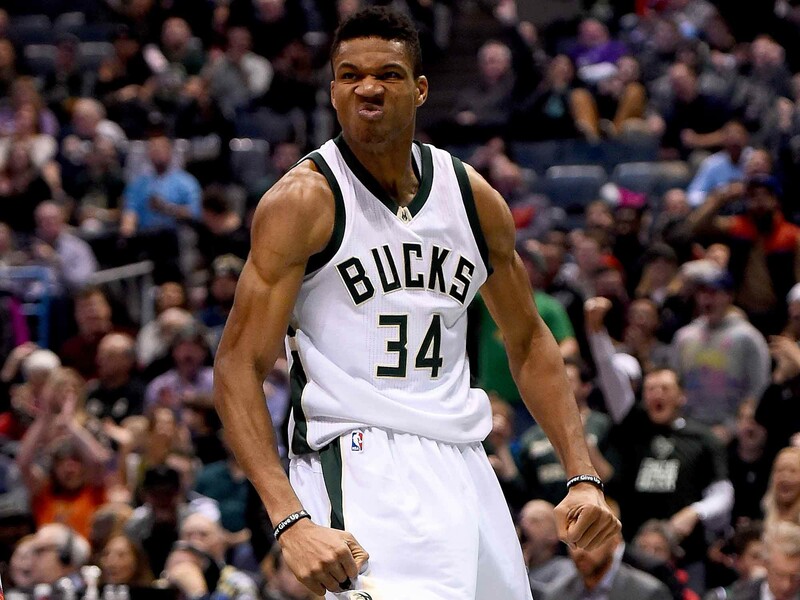 Averaging 26.9 points, 10 rebounds, and 4.8 assists per game, the Greek Freak carries the weight of his team’s success on his shoulders. With a mediocre lineup of experienced players, and marginal no-names, the Bucks roster is fairly unimpressive with the one exception of the team’s not-so secret weapon. Antetokounmpo has an ability that other NBA greats like James, and Russell Westbrook have of willing their teams into wining games. If the Bucks could just fill in some more potent role players they might have a serious team on their hands. For now, the Bucks impress in the regular season, and that typically turns into a ground out at 1st for them in the playoffs. Unfortunately for Antetokounmpo, he’s right in the middle of his 4-year contract extension so he won’t have any bargaining power as a free agent for a couple years to come. Preseason continues this weekend with a lengthy line-up with the regular season right around the corner. From the looks of things in the first couple of games, it’s going to be a really exciting year!